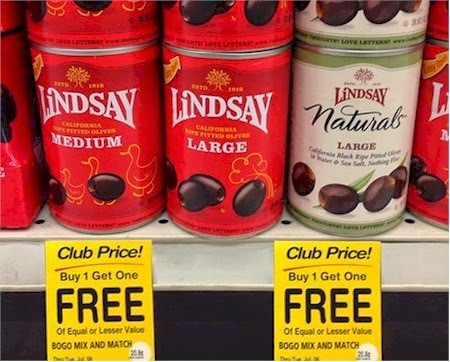 If you've got a Safeway, Vons, Tom Thumb, Randalls, or Carrs nearby, it's stockup time on Lindsay Olives, which are available for BOGO (buy-one-get-one-free) through 7/8/14. 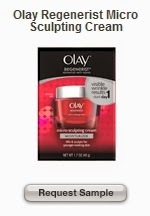 Request your free sample of Olay Regenerist Micro Sculpting Cream from Target here. My husband never wanted to eat any "fake" cheese. He claimed the quality of most non-dairy cheeses was awful, that is, until he found Daiya cheese. He really likes the taste and loves the fact that it actually melts like real cheese. 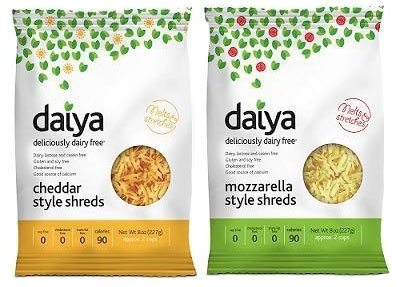 (Kosher-keeping Daily Cheapskate readers will be interested to know that vegan Daiya shreds are OU pareve.) Hello kosher cheeseburgers! Print this rare coupon for Daiya cheese from their Facebook page. 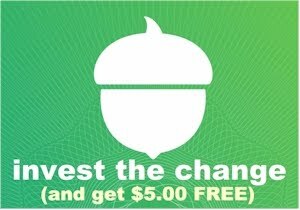 You can print a $1.00 coupon if you share their link on your Facebook wall or a $0.50 coupon if you don't. You can get Daiya cheese from Whole Foods (an 8 oz. bag is usually $4.69 at the Denver WF), Sprouts and other natural foods stores. Today, 6/30/14 only, everything on Tanga.com ships for free when you enter promo code SUMMERSHIP at checkout. JetBlue has an awesome new promotion out in concert with Dunkin Donuts. 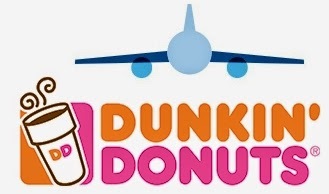 Purchase specially marked packages of Dunkin Donuts K-cups or 1-lb bags coffee at Dunkin Donuts locations to get a special promo code that will give you 20% off when booking your next JetBlue flight online. We fly JetBlue often and we use Dunkin Donuts k-cups, so I'm really thrilled with this promotion. Search flights within travel dates listed above. Promo code is good for roundtrip flights only. Both outbound and return dates must fall within offer period in order for the discount to apply. Enter code in promo code field exactly as it appears (case sensitive). You must select flights in order for discount to be revealed. Once flights are selected, you will see the discount amount displayed in the itinerary subtotal on the right side of the flights page. 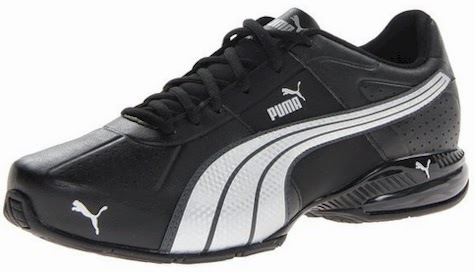 Today's Amazon Gold Box Deal of the Day is on these select Puma training sneakers for both women and men, all marked down to $39.99 with free shipping. 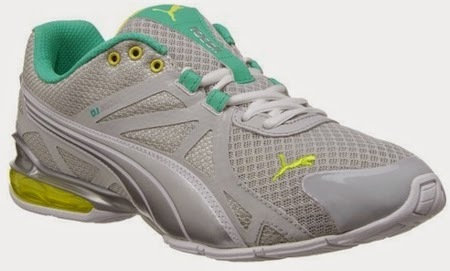 The styles that are included in this Gold Box Deal, the Puma Voltaic 5, the Puma Cell Surin, and the Puma Cell Riaze, are designed to support and cushion the feet during cardio workouts, boot camps, weightlifting, and more. These shoes go for upwards of $65.00 at other vendors. As of this posting, there are plenty of sizes, styles and colors available, but Amazon Gold Box deals on shoes always fly, so if you need a pair of good sneakers at a great price, I wouldn't wait too long. 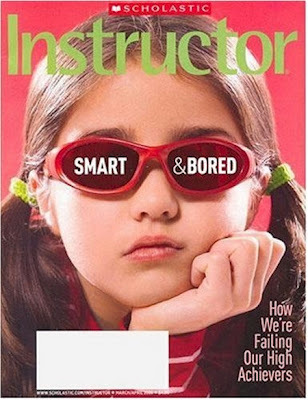 If you've never seen Instructor magazine before, it's a great resource for fresh teaching insight, time-saving tips, hands-on activities, professional development features, new children's literature reviews, teaching strategies, and free posters. 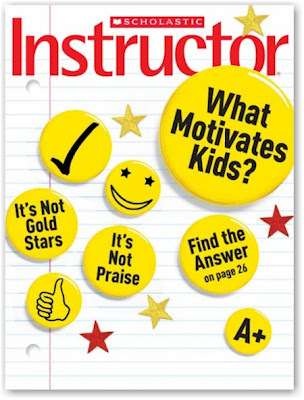 Educators, teachers, parents, and home-schoolers, get Instructor magazine for $4.99 per year (6 issues, $0.83 each), when you enter promo code DAILYCHEAPSKATE at checkout. This price is good for today, 6/30/14 only and is good on new subscriptions, gift subscriptions and renewals. You can lock in this pricing for up to three years. I'm so excited! My husband and I are renting our very first summer home this year, and we'll be heading out for the Catskills shortly. We would love to be able to barbecue on a gas grill while we are in the country, but since we keep kosher, we would need to buy a new grill and we would probably just end up leaving it there, hopefully in storage for next year, but more likely just leaving it behind. With the latter possibility in mind, we don't want to spend more than $150 tops for a grill, but we also don't want to buy junk. Any suggestions for a brand-name grill that won't cost a ton of money, preferably one that we can get delivered to our summer place? Thanks! 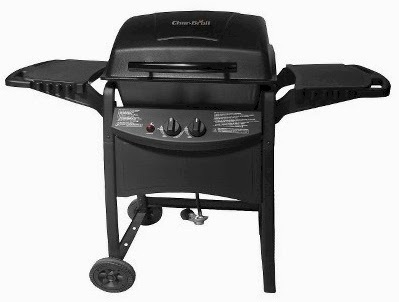 Nechama, Target has got this wonderful deal on a Char Broil 2-burner gas grill for $79.00 with free shipping here. If you use a Target RedCard, that price will drop by another 5% to $75.05. This gaas grill got 4.1 out of 5 stars over 50 customer reviews and includes 280 square inches of grill cooking space. It's a well-known brand name, a nice size, well-rated, a fantastic price (almost half of what you wanted to spend), and will ship for free to your summer rental, so it's a perfect fit for your summertime vacation needs! Enjoy barbecuing! Lenox is having an awesome promotion today, 6/29/14 only: $0.40 flat rate shipping on all orders! The Lenox L'Chaim Mezuzah case is normally $47.00, marked down to $27.95, but is now $11.95 + $0.40 flat rate shipping = $12.35 at Lenox.com today. This 4-7/8" mezuzah case is crafted of ivory Lenox fine china. We bought this for our seder this past year, and it's absolutely beautiful, even nicer, I think, than the traditional Lenox Seder Plate. It's crafted of Lenox ivory fine china, decorated by hand, and accented with gold. The diameter on this plate is 14 3/4". 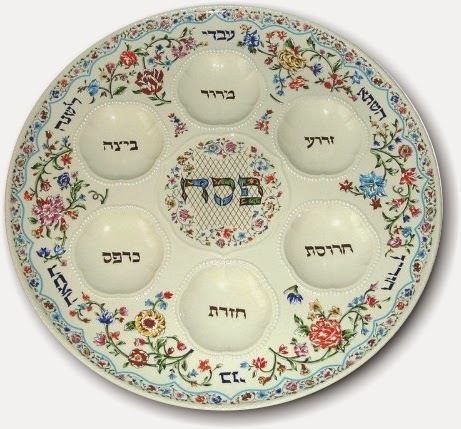 (FYI, Amazon has this exact same Seder Plate for $184.00). Finally, the Lenox L'Chaim candlesticks were originally $140.00 and are now on sale for $27.95 + $0.40 shipping = $28.35. 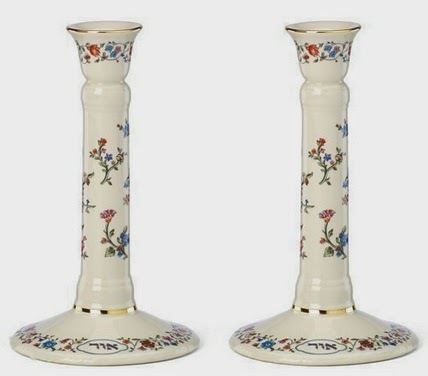 These 8" Lenox ivory fine china candlesticks are inscribed with the word "Ohr" ("light" in Hebrew), adorned with a delicate design of flowers and vines, and accented with gold. All three of these make great gifts and they will never know how little you spent; keep in mind that no matter how many you purchase at once, the shipping is still a flat $0.40, today only. 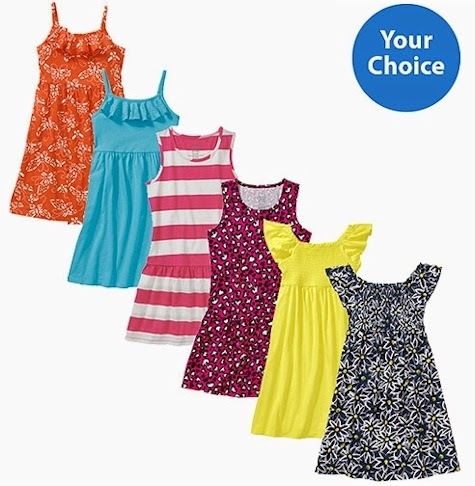 Walmart has got a selection of 100% cotton girls' Faded Glory dresses for $5.80. Shipping is a flat-rate $4.97, no matter how many dresses you order, or FREE with a $50.00 minimum purchase. There are 11 styles available in girls' sizes 4/5 through 17/18. These are machine washable (turn them inside-out first). Wow! 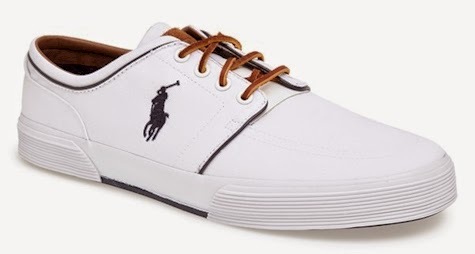 Nordstrom has got these Polo by Ralph Lauren'Faxon Low' Sneakers for men at half-price for $29.47 with free shipping (and free returns). Tons of sizes and half-sizes are available from sizes 7-14. It's available in three color combos: grey/orange, white/navy, and khaki/blue. 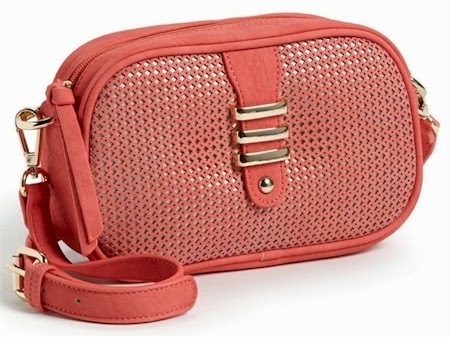 Nordstrom has got this Selena Crossbody bag in coral (pictured above) and taupe (pictured below) for just $17.98 with free shipping (and returns). 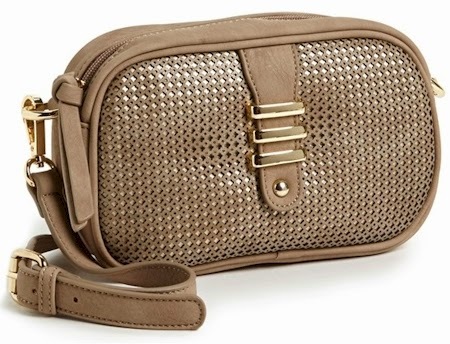 The bag is 8 ½"W x 5 ½"H x 3"D and has got a 24" - 26" crossbody strap drop. 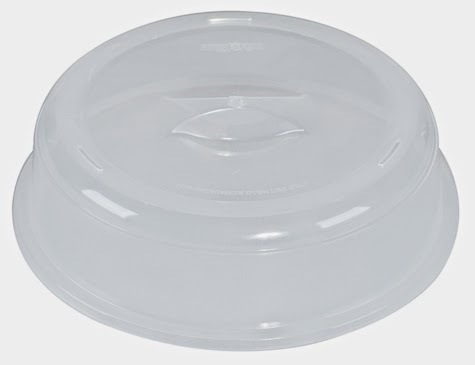 Amazon has got the Nordic Ware Microwave 10.5 Inch Spatter Cover for $1.97. It's an Amazon Add-On item, which means that it ships free for Prime members with a $25 purchase and ships free for non-Prime members with a $35 purchase. We've got one of these and it keeps our microwave clean and splatter-free; I scrub out the microwave every other week, instead of every week. Print your coupon for $1.00 off any two MorningStar Farms Veggie Products here. MorningStar Farms items are on sale at Target this week, 2 for $7.00 ($3.00 each after coupon) and when you buy two, you'll get a free Arnold brand sandwich thin 8-count package for free. 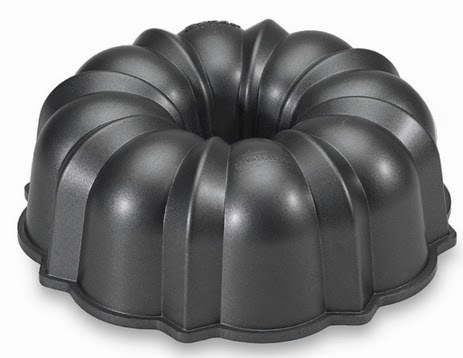 Amazon has got the Nordic Ware Pro Cast Original Bundt Pan for $17.00 with free Prime/SuperSaver shipping. 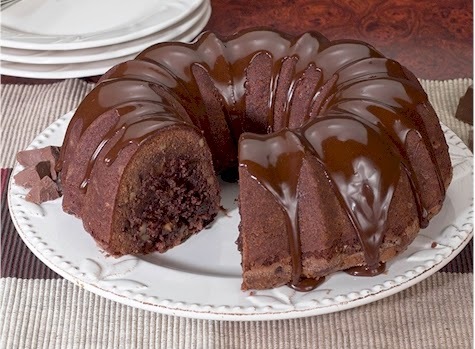 This highly rated bundt pan is priced at around $8.00-$9.00 dollars less than Nordic Ware's other classic bundt pans, here and here. It's got 4.6 out of 5 stars over 57 customer reviews and seems to mold a gorgeous cake (but still use a the baking spray that has a little flour in it for a guaranteed non-stick experience, IMHO). And while you're upgrading your bakeware, don't forget that you can get this 6-piece Calphalon bakeware for $25.49 with free Prime/SuperSaver shipping. Nordstrom has got this h.i.p. Tri-Blend Knit Maxi Skirt for $14.40 with free shipping (and free returns) in three colors, black, navy and gray, sizes XS, S, M, and L. Approximate length: 40". 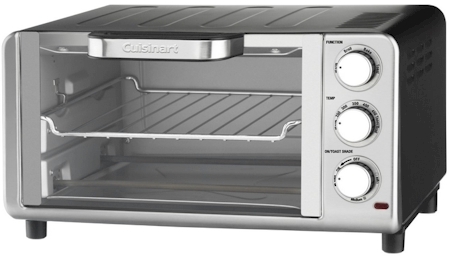 Made in the U.S.A.
Amazon has got the Cuisinart TOB-80 compact toaster oven for $39.92 with free shipping, the lowest price this toaster oven has ever gone for on Amazon. Compare this price to the identical toaster oven at Macy's, Buy.com, Overstock.com, and Wayfair, etc. Brushed stainless steel housing is compact and counter-friendly at a 0.35 cubic-foot capacity. 7 functions in 1: Toast, Bagel, Sandwich, Bake, Broil, Leftover and Keep Warm. Toast shade control dial for toast just the way you want it. Easy-clean nonstick interior includes convenient hands free auto-slideout rack, removable crumb tray. Includes baking tray, broiling rack and recipe book; limited 3-year warranty. 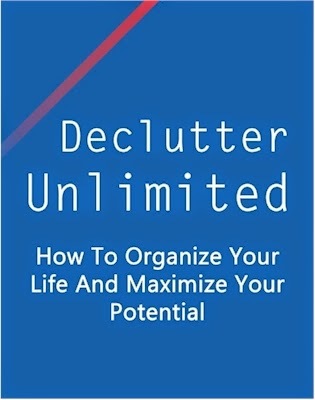 Amazon has got Declutter Unlimited: How to Organize Your Life and Maximize Your Potential available for a free download for a limited time. Since Amazon's #1 seller is the Kindle, they call e-books "Kindle books," but if you don't own a Kindle, it's not a problem at all to read this with ease. Try installing the Universal Kindle Reading App first, before any of the ones below. It should work on most devices. If it doesn't do the trick, here are some supereasy instructions for reading Kindle eBooks on pretty much any device, including smartphones, computers and tablets. I read Kindle books on my laptop and iPad all the time. 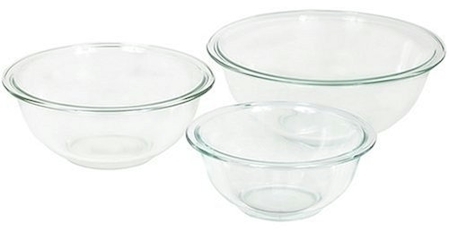 Get this set of three Pyrex prep mixing bowls from Amazon for just $9.89 with free Prime/SuperSaver shipping, ($0.30 away from the lowest Amazon price ever posted on these Pyrex bowls, $9.59). The bowls are 1 quart, 1-1/2 quarts, and 2-1/2 quarts. They are safe to use in the freezer, dishwasher, oven and microwave. This is one of the most practical, frugal kitchen buys you'll ever make. Wow! 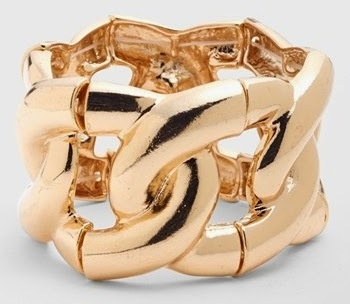 Nordstrom has got this very current, uber-popular, statement DCK chunky chain stretch bracelet for $9.38 with free shipping, free returns. Through 6/30/14, get this Diamond Flower Ring set in .925 sterling silver for $14.00 with free shipping from Szul. Item description: 6 stone all natural, genuine diamond ring set in sparkling .925 sterling silver. 6 round diamonds are channel set on this lovely ring and weigh a total of 0.06 carats. A simple, yet classic piece great for casual and formal wear. The .925 sterling silver band is rhodium plated, like white gold, to prevent from tarnishing. A solid ring featuring exceptional workmanship and quality. Diamond Color I-J, Clarity I2-I3. Amazon has got this set of four Linz mugs (supposed to be used for beer, but those elegant lines can really work for any beverage) for it's lowest historical price, $9.99 with free Prime/SuperSaver shipping ($2.50 per glass). I just bought three sets. I LOVE the design on these. 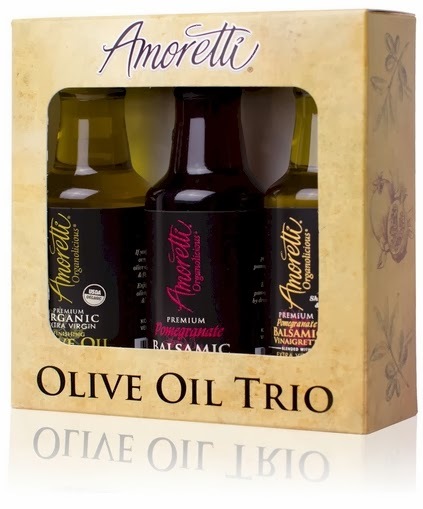 Amazon has still got this Amoretti Olive Oil Trio (oil, vinegar, and vinaigrette) for only $10.99 with free Prime/SuperSaver shipping. 50ml bottles are perfect for gifts. Amazon is having a great sale on select Mega Bloks toys over here , with prices starting at $7.99. 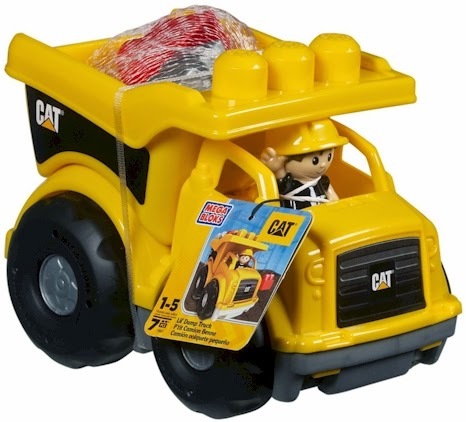 The Mega Bloks Caterpillar Lil' Dump Truck (rated 4.7 out of 5 stars) pictured above is only $9.59 with free Prime/SuperSaver shipping. Check out the rest of the selection for some nice 20% off deals. Print your coupon for $1.00 off any Bayer aspirin product. And boy, do I need this coupon. 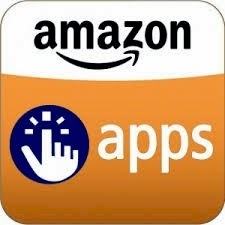 Today and tomorrow only: Amazon is giving away 31 FREE APPS! Wow! Amazon is doing a MASSIVE app giveaway today. If your tablet or smartphone runs on an Android operating system, you have got to download these 31 free apps which normally range from $2.49 to $14.99 . Download them now for free while you can (through 6/28/14), and then later on, cull the ones that you don't want. Nordstron has got this faux leather Woven Chain Watch for just $9.98 with free shipping and free returns. Crystal indexes dot the rectangular face of this trendy, stackable watch fit with a faux-leather-woven, double-chain strap. 26mm case, 17mm band width. Goldtone plate/polyurethane/metal alloy/stainless steel caseback/crystal. 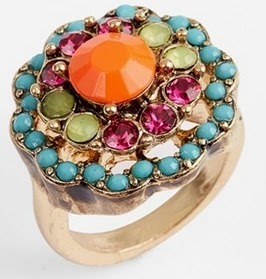 Nordstrom has this colorful TopShop Floral Cocktail Ring for only $9.99 with free shipping and free returns. Small size only (~ size 5). So supercute. These 6-packs of Capri Yoga Leggings are priced at $89.99, but enter promo code SUMMER80 at checkout and that price drops to $17.99 with free shipping ($3.00/pair of leggings). Perfect for high fashion capri pants or leggings for your wardrobe. Print your coupon for $3.00 off two Starbucks K-cup packs. Print your $1.00 off any two Earthbound Farm Organic products coupon here. 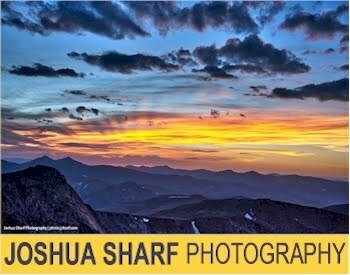 Click on the coupon link at the bottom of the page on the right side. 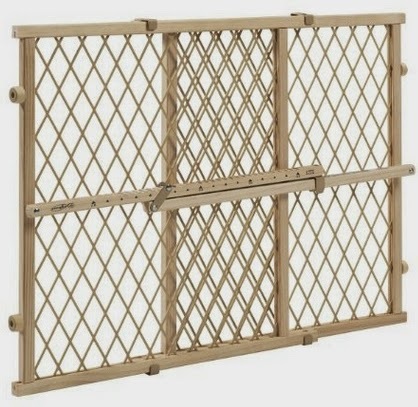 Amazon has got the Evenflo Position and Lock Wooden Gate for $10.00 with free Prime/SuperSaver shipping. 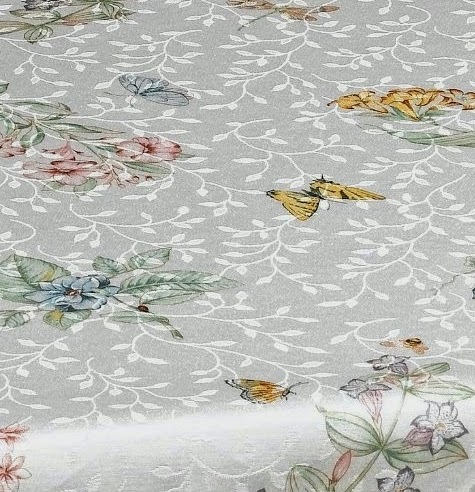 Amazon has got this 52" x 70" Lenox Butterfly Meadow tablecloth for $13.95 with free Prime/SuperSaver shipping. 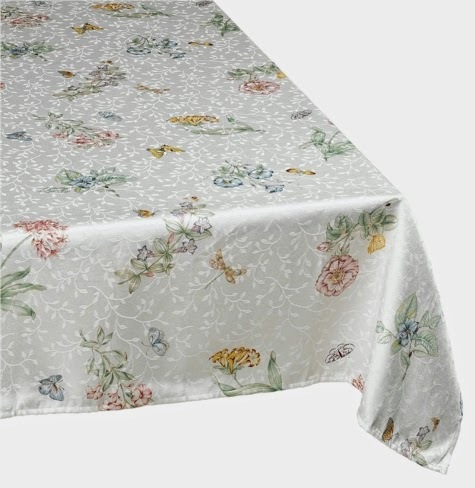 This fine tablecloth received 4.7 out of 5 stars over 238 customer reviews (189 were 5 star!). The tablecloth material is 54% cotton and 46% polyester. 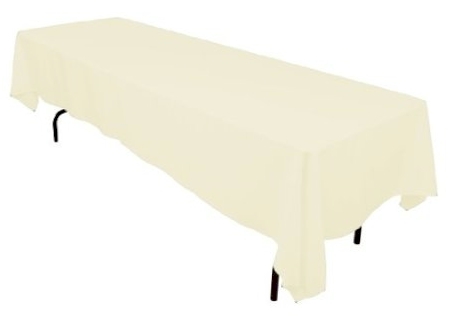 On the other side of the linen spectrum, Amazon has this white 60" x 126" wrinkle- and stain-resistant tablecloth for $7.99 with free Prime/SuperSaver shipping. 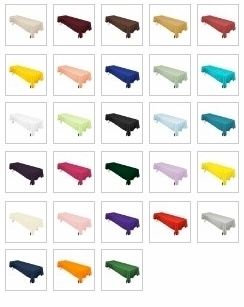 Besides white, it comes in 28 colors that are more expensive but still reasonably priced compared to other tablecloths. Because this tablecloth is so super-practical, I track the pricing on it regularly. I've got a bunch of these in white and they are very washable and durable. These are a lifesaver for Yom-Tovs-of-Endless-Meals, like Pesach and Sukkot, and the current price is certainly right. These are polyester, so when you order, don't expect to get a tablecloth that's going to be of the same quality as the Lenox one, or your Bubbie's finest linens. On the other hand, since I can't wash or iron tablecloths during Pesach and Succos, I'm grateful to have long white tablecloths that I can just dress up with a pretty runner or centerpiece, and after the holiday, they all go right into the washing machine. $1.00 off Bob's Red Mill "Grains of Discovery"
It's back! 30% off select jewelry on Amazon!